BBC Children in Need has announced that it has awarded a total of £215,628 to two local projects providing services to disadvantaged children and young people. The charity currently funds 22 projects across Cardiff, with over £1.3m invested locally. The newly awarded grants come as BBC Children in Need celebrates its fundraising total for the 2017 Appeal: £60.7 million. Highlights from the 2017 Appeal include BBC Radio 2’s amazing fundraising efforts spearheaded by Chris Evans’ Breakfast Show which saw millions raised through CarFest and the Breakfast Show’s incredible auctions, Countryfile’s 2017 calendar and Ramble weekends, The One Show’s Rickshaw Challenge and a BBC Children in Need Rocks the 80’s concert. 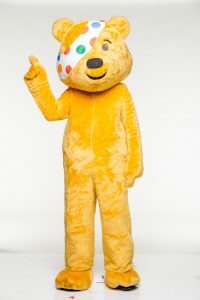 BBC TV and radio stations across the Nations and Regions threw themselves into fundraising whilst the charity’s corporate partners, including Asda and Boots UK, once again galvanised customers and staff to support Pudsey. And of course, hundreds and thousands of people across the UK came together to support the charity in many different ways, including schools up and down the UK going spotty for Pudsey, and community groups such as Rotary encouraging fundraising on a local level. UCAN Productions has been awarded £111,710 to provide drama and music activities for visually impaired children and young people in South East Wales. The fully accessible activities will involve music, movement; sound recording and drama, all designed to encourage the children and young people to build on their strengths. Through attending the three year project, which starts in January, children and young people will grow in confidence, strengthen their aspirations, and make more friends. Also celebrating a recent grant is Displaced People in Action (DPIA) which has been granted £103,918 to provide play sessions and trips for refugee and asylum seeking children and young people. Over the next three years the project will deliver weekly play sessions offering children and young people a range of fun activities such as messy-play, arts and crafts, soft-play, toys, cinema club, singing and sports and games. In addition, the project will provide a programme of educational trips, visits and outdoor activities during the school holidays and half term periods. Through attending the project children and young people will have fun, improve their well-being and build friendships. BBC Children in Need awards grants at seven points during the year and funds two types of grants, both of which are open to new or existing applicants. A Main Grants Programme is for grants over £10,000 per year to support projects for up to three years. Meanwhile, BBC Children in Need’s Small Grants Programme supports projects for up to three years, and includes grants up to and including £10,000 per year. Both of these programmes are currently open to applications. Alongside the main and small grants programmes, BBC Children in Need are continuing to develop Curiosity – a partnership with Wellcome – which awards grants to organisations using inspiring science activities to create change for disadvantaged children and young people. 32 organisations have already been funded by the Curiosity programme and more information will be available this summer about further funding opportunities. BBC Children in Need relies on the generosity and creativity of the thousands of supporters and fundraisers who raise millions of pounds for the charity every year. To date the UK public has raised over £972 million for children and young people facing disadvantage across the UK.